Nancy Seiler is a certified GOLDEN Working Artist specializing in acrylic and watercolor mediums. She is also a classical botanical illustrator. 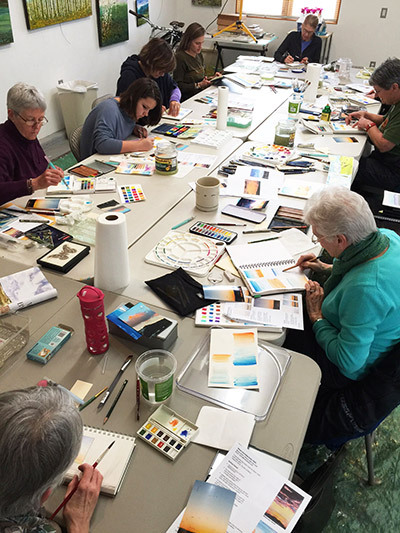 Nancy offers a variety of art workshops in nature journaling, botanical illustration, acrylic painting, and mixed media. Please click here for current workshop offerings. Workshop Policies Pre-registration and payment are required to secure your spot in a workshop. Please click here to register. Registration host, Eventbrite, will send you an automatic confirmation upon registration. Nancy will send an email confirmation and a materials list (if required), too. Please note refund policy when registering for each class. There is no credit or make-up for missed workshops although you may send someone in your place (unless class has a pre-requisite requirement). If Nancy must cancel a workshop, you will receive a full refund.